Yesterday I was reminded that a little bit of faith can move mountains. Of course I think David was demonstrating more than just "a little bit of faith" when he picked five smooth stones from the stream bed, tightened the band on his sling shot, and headed out to meet Goliath. While the Israelite army stood on the banks of the mountains watching this young man with skepticism, David walked into the valley dominated by this mocking giant with confidence and no fear. How did he do that? He knew the battle wasn't really his, but God's. 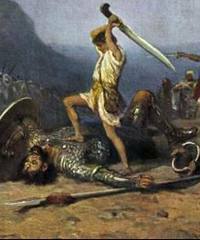 He knew Goliath may taunt him, but he was really standing in opposition to David's almighty God. He knew he simply needed to do what he knew how to do and God would do the rest. Faith in itself is not powerful. It's not some magical, potent positive feeling we muster up within in order to produce results without. But when we place our faith, even as small as it may be, in our very big, powerful, and faithful God, huge things happen. Faith is not powerful. The God in whom we place our faith is. And so that takes the pressure off of us. We don't have to "work up" some huge faith. We don't have to exercise big faith in order for big things to happen. We simply have to agree wholeheartedly that God is good and He has it, whatever it may be, under control. He can handle it and He will. The more we know God, the easier it is to believe that He will work. The longer we walk with God, the less we'll fear that He won't show up. The bigger the things we see Him do over time, the less we'll sweat the little stuff. Daniel 11:32 says, "The people who know their God will gain strength and take action." David knew his God. That personal knowledge of God strengthened him and spurred him on to action. On the other hand, Saul, who had been anointed king by God, had not bothered to get to know God all that well. And he was frozen on that mountain bank along with the rest of the men of Israel, worrying about who could step out on the battleground with Goliath. His lack of faith froze him in inaction. But as I read this familiar story this morning, I also noticed a couple of interesting side effects of David's faith. I think we might want to take note of these because sometimes, if we're not aware of what's going on, these attitudes might stunt our faith. First of all, David's own brother Eliab misinterpreted David's faith as pride and arrogance. In 1 Samuel 17:28 we read Eliab's reaction to David's simple expression of faith. those few sheep in the wilderness? down to see the battle. Positive, God-fearing, genuine faith can sometimes be mistaken for arrogance. True faith pushes fear out of the way - fear of man or circumstances, that is. True faith leaves no room for question or doubt. It causes us to step forward when others are inching backwards. It keeps the song in our heart going when others simply hear their anxious hearts beating loudly in their chest. It causes us to appear calm and confident and assured while others are worrying, fretting. And thus it's sometimes mistaken for audacious, gullible, and prideful arrogance. I doubt I've ever displayed so great a faith as to cause someone to mistake it for arrogance, but maybe... However, I know I've been guilty of misinterpreting others' faith as cockiness. Why would I do that? Only for one reason. Because they had something I didn't have at the moment: faith. Eliab was among the men who were shaking in their sandals. He didn't have the courage to go down and face Goliath. So when David questioned his fear based on God's faithfulness, it aggravated Eliab, shamed him. And he immediately accused David of something we know to be untrue. He said David had pride and insolence in his heart. But just a chapter earlier we read that David was the son of Jesse whom God had selected to be the next king based on the good that was in his heart. I doubt very seriously that when God "examined the heart" of David instead of looking on the outside, as He said men do, that He found pride and insolence. But Eliab's fear caused him to misjudge David's faith. I need to be cautious of judging others' faith with such skepticism and cynicism. The second interesting side effect of strong faith is that others take notice when we demonstrate such faith, faith that moves us into action when others are standing still. Saul had been enjoying the soothing music of David's skillful harp playing for some time. When Saul's servants had the bright idea of calling in David to help soothe Saul's tormented mind, they actually told Saul that David was "the son of Jesse, a skillful musician, a mighty man of valor, a man of war, prudent in speech, and a handsome person." In fact, they even told Saul that David, this guy who would come and play the harp for him, knew the Lord intimately. I suppose all of that impressed Saul sufficiently because he sent for David and enjoyed his music in his personal chambers time and time again. And yet, he never seemed to notice David. The music helped him tremendously, but it didn't cause him to pay any attention to David. He had heard of David's reputation for being a man of war and valiant, but he hadn't asked him to fight in his army. But when David steps onto the battlefield with faith in God and accomplishes what others could not, Saul suddenly takes notice. with the head of the Philistine in his hand. And Saul said to him, "Whose son are you, young man?" of your servant Jesse the Bethlehemite." Saul had already been told who David was, but he didn't recall that. But now he goes out of his way to find out who he is. When you and I step out in faith, others will notice. And while our goal is not to draw attention to ourselves, our active faith does give us a platform from which to share who we belong to as well. "I am a child of God. He is my Father and He takes care of me. That's why I don't fear." Faith is a simple key to unlocking the power of God in our lives. But it also has some interesting side effects, wouldn't you agree?